After the initial outrage of Apple removing the headphone jack from the iPhone 7 died down, users not wanting to go wireless soon realized that using the phone’s Lightning port meant they could no longer charge while listening to music. Pioneer’s new Rayz Plus earbuds include a simple solution to that problem, but they’re still far from perfect. Wireless headphones are probably the future of music, like it or not. More and more mobile devices are ditching the headphone jack to make room for other technologies, despite the inconveniences of having yet another electronic accessory to keep charged, and the risk of losing a pricey set of wireless earbuds. But for those who still aren’t ready to go wireless, Pioneer’s Rayz Plus earbuds seem like a better alternative than connecting a bunch of bulky dongles to your phone—and it’s not like the company had to re-invent the wheel. 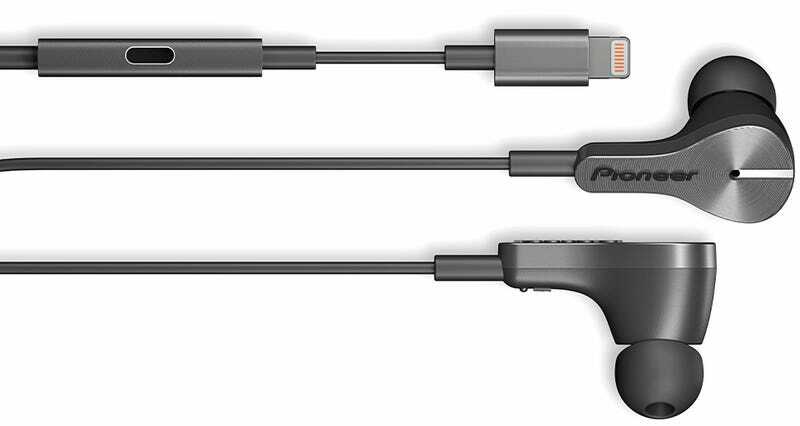 All Pioneer did was add a compact inline dongle to the cable with an additional Lightning pass-through port that allows users to keep charging an iPhone or iPad while listening to music or movies. It’s an upgrade Apple could have, and should have, added to the headphones it bundles with the iPhone 7, instead of just bundling an annoying Lightning adapter. Because the Rayz Plus can only connect to a device with a Lightning port, it means they’ll always have a source of power, which Pioneer is taking advantage of to include noise cancelling functionality. The inclusion of multiple microphones in each ear does add weight and bulk to each earbud, but without the need for batteries the Rayz Plus, like JBL’s Reflect Aware headphones, appear to be some one of the smallest noise cancelling solutions available right now. To further entice you to drop $150 on the Rayz Plus which include the extra charging port, and the $100 Rayz which don’t, Pioneer has also added an additional programmable button to the headphone’s inline remote that can be customized through a free accompanying iOS app for quickly launching apps while your phone is still buried in your pocket. It’s unknown how genuinely useful that will be, but as an alternative to going wireless, Pioneer’s Rayz still seem like the least annoying way to deal with the death of the headphone jack.